KV2 Audio’s philosophy has always been to embrace the principles of point source speaker system design to provide optimum sound quality and coverage for applications and audiences of all sizes. The challenge for KV2 in building a large point source system for audiences of 50,000 people plus, was to reproduce the low mid energy that certain line arrays provide, though the summing of multiple drivers whilst maintaining the key benefits of point source technology. These benefits include minimal destructive interference in the higher frequency range, accurate impulse response and superior sound. There are two main types of sound system designs that have been prominent in the market, consisting of single point source or multiple point source concepts. Multi point source arose from the requirements for very high output power. The idea satisfied that criteria, but with the increasing number of sound sources came an overall reduction in the quality of the sound. The two big disadvantages of multipoint source systems were the suppression of the high frequency output and the physically time-shifted outputs from the individual speakers. Adding a number of time-shifted outputs from individual speakers together causes poor system impulse response. The first types of multipoint sources were simply a large pile of cabinets, stacked together like building blocks and intended to array on all axis. A major improvement in the next generation of systems was the introduction of multipoint, one-axis systems that provided better frequency response and increased definition than previous multi axes systems. Unfortunately, whilst a step forward, the frequency response and impulse responses were still not ideal and the coverage was often inconsistent. A typical representation of the one axis multipoint source sound system used commonly today is a line array system. Line array does reduce the effect of multipoint sources interfering with each other like the systems of twenty-five years ago, but it is still a long way from the superior results achievable with single point sources. A single point source sound system offers the highest possible definition and dynamic range available today. High intelligibility is a by-product of this, but is only guaranteed by maintaining this high definition and high dynamics through the use of fast and accurate electronics, with low distortion transducers. A line array’s natural frequency response before processing shows a continual roll off of high frequencies from 2 kHz upwards due to cancellation caused by the proximity of the numerous high frequency drivers. This requires large amounts of equalisation to be added to the top end to correct this phenomena. This huge boost in gain on the highs, lowers the system’s overall headroom, on average a line array requires ten times the power to drive the top end compared to a single point source cabinet. Hence high power is not necessarily a requirement for large-scale coverage but quite often a result of a system’s inefficiencies. Further to this when using multiple speaker cabinets in a line array the listener receives multiples of the original sound at slightly different times, smearing the time based information contained within. To maintain a high resolution audio signal, it is vital that the system is able to exhibit a short impulse response time. The impulse response from a line array is damaged due to time shifts in the sound arriving to the listener. 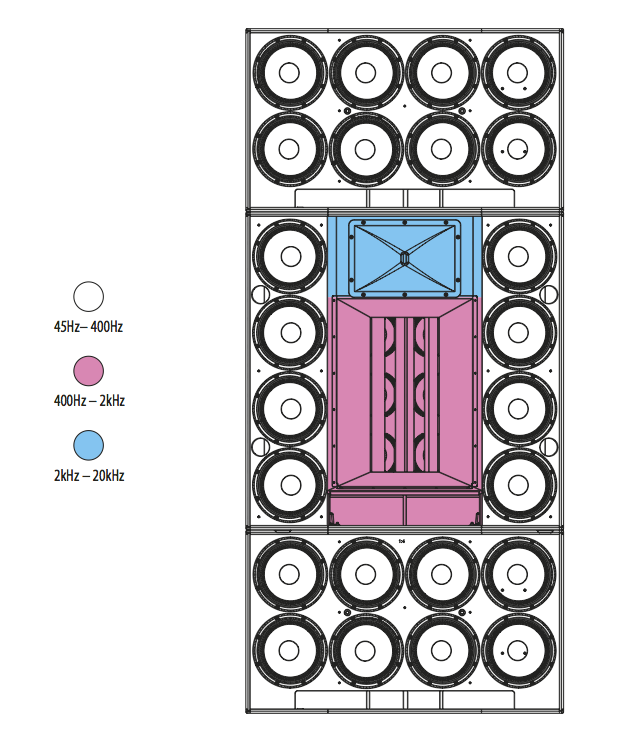 The diagrams below show that the pulse response of a line array will vary with the location of each individual listener. Time shifts for listener 1 are different to those for listener 2. Many manufacturers claim that these time shifts can be corrected using digital delays, however this does not provide a solution because time shifts will infinitely vary with each new listener postion. Another myth relating to line arrays is the idea that all of the elements couple, to produce a controlled, directed, long throw soundfield. As we can see by the polar patterns below this is far from the case. The top pattern shows the smooth dispersion of a point source system compared to the erratic dispersion of a line array. As we can see from this polar pattern what actually occurs with a line array is a range of peaks and troughs, caused by destructive and constructive interference between the elements. Even more critically, one factor overlooked by system engineers or line array prediction software, is the random movement of the air in the listening area. This causes huge changes in the transmission properties of multipoint systems. It occurs when an audience arrives, after the system engineer has spent the whole day aligning the system to an empty but theoretically perfect environment – an environment that in a real concert situation will never exist. Utilising highly advanced point source speaker design, extremely efficient power management amplifier technology and totally unique hybrid signal processing, KV2 has created the first major advancement in large scale concert sound reinforcement since the development of the Line Array. The VHD5.0 Constant Power Point Source System is a true feat of engineering. Over five years in development it brings the benefits of point source technology to large‑scale concert sound reinforcement. The system delivers audio over large areas with clarity and definition simply not achievable from the digitally processed line arrays that are so commonly used today. For some time now line arrays have been predominantly used for large concert sound systems. Having all components in a single axis array has solved certain issues in respect to comb filtering problems in the horizontal plane, but destructive interference still occurs from the multiple HF horns mounted vertically. The loss of high frequencies and cancellations through air disturbance caused by audience heat and wind is another major issue. Manufacturers have attempted to correct these problems in numerous ways both through acoustic design and DSP, however the end result has been further reductions in resolution, due to the limitations of digital sampling and the simple principles of physics that cannot be ignored. At KV2 we believe that definition equals distance and the higher the reproduction quality of the source, the better the intelligibility over distance. The theory that line arrays have less losses over distance than point source is not only incorrect, but somewhat irrelevant if the sound is not intelligible at the back of the venue anyway. To achieve the high definition needed to cover long distances we have focused on developing unique hybrid processing, which takes the very best available technologies in both the analogue and digital domains, advancing system design to a whole new level. The end result is ultimate resolution, Very High Definition sound, impulse accuracy and phase coherent audio arriving at the listening position, even over long distance. To cover very large crowds you need a large system capable of delivering high SPL, running multiple components. To do this, as one large point source enclosure is somewhat difficult as it would be almost impossible to move around or transport. With the VHD5.0 Constant Power Point Source Array, KV2 has focused on creating a modular system that has minimal destructive interference while utilising multiple components in a small number of cabinets. VHD 8.10 Low Mid Expansion Boxes are arrayed around the VHD5.0 Mid High Enclosure providing the extra headroom needed to deliver the low mids, keeping the sound balanced. In essence the system is pieced together to represent one very large point source, each part of the system is proportional in size to the frequency wavelengths it reproduces. The radiated power of each bandwidth therefore remains consistent and balanced in relevance to the overall frequency response. This ensures the same sound is delivered to every seat in the house. The high frequency horn in the VHD5.0 combines three 3” NVPD (Nitrate Vapour Particle Deposition) Titanium Drivers on a special manifold horn with summing wave‑guide. Delivering incredible output with extremely low distortion, this unique horn assembly provides crystal clear highs over distance with much higher resistance to air disturbances.